Ball, Cheryl E. (2013). Multimodal revision techniques in webtexts. Classroom Discourse [special issue: Multimodality]. 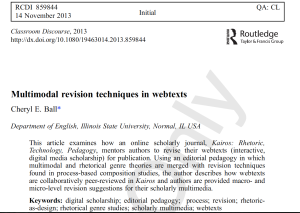 This article examines how an online, scholarly journal, Kairos: Rhetoric, Technology, Pedagogy mentors authors to revise their webtexts (interactive, digital media scholarship) for publication. 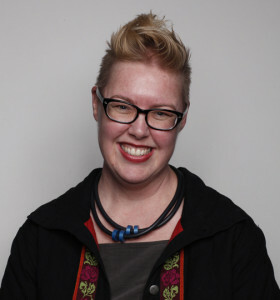 Using an editorial pedagogy, in which multimodal and rhetorical genre theories are merged with revision techniques found in process-based composition studies, the author describes how webtexts are collaboratively peer-reviewed in Kairos and authors are provided macro- and micro-level revision suggestions for their scholarly multimedia.